An alternative to our Cambridge Arch, this unit incorporates two arches, creating a 26" deep bonnet atop large 5½ x 5½ posts. Decorative brackets and attention to detail combine to make a strong statement in both form and function. 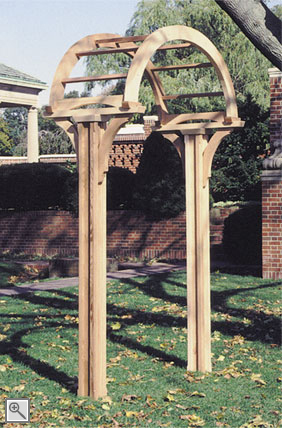 This piece can accommodate lattice side extensions placed to either side of the arch, similar to those pictured with the Rockport Arbor. 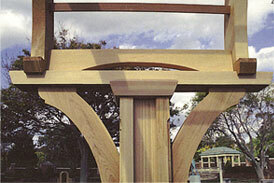 Also available with any of our gate styles, as referenced in our Arbor Gates and Extensions section.